Lysrør av ypperste kvalitet for kritisk fargeevaluering. 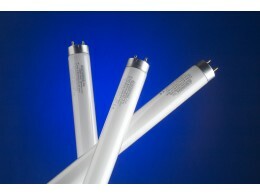 A properly designed color matching system takes into consideration the output and color quality of the lamps. In order to assure excellent color rendition and tight tolerance visual agreement, all GTI color matching systems utilize GTI ColorMatcher 6500K Color Matching Lamps. GTI ColorMatcher 6500K lamps are manufactured with a unique blend of fluorescent phosphors that is unequaled by any other 6500 Kelvin lamp in the industry. GTI lamps produce a true full spectrum white light which renders colors with the highest degree of accuracy and efficiency. When used in GTI color matching systems, the GTI ColorMatcher 6500K lamp produces an actual system CRI rating of B/C based on CIE Standard 15.2 and Publication 51, one of the highest in the industry. GTI color matching systems include a reflector, diffuser, the booth structure, geometry of illumination, and GTI ColorMatcher 6500K lamps. A change in this system’s formulation can create a slight color cast that will impact color assessment, resulting in a viewing environment that is not ASTM compliant. To maintain an ASTM D1729 compliant viewing system, use only GTI ColorMatcher lamps and relamp regularly. A lamp’s color output and intensity changes over time. To maintain consistent and accurate viewing conditions, color matching systems should be relamped after every 2,500 hours of use. GTI color matching systems should be relamped only with GTI ColorMatcher 6500K lamps.